A MacRumors forums member has posted a screengrab of the iPhone Dev Portal which updated the terms and conditions yesterday (supposedly) with the line "need to update this for the 27th launch." So there'll be a new iPhone OS, hmm? 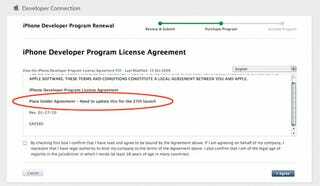 "I had let my developers license lapse, and I wanted to renew it today. I noticed that the portal went down for a while with the "We'll be back soon!" placeholder. When it was back up, I went in and renewed my account. I thought the Ts&Cs were a bit funny."